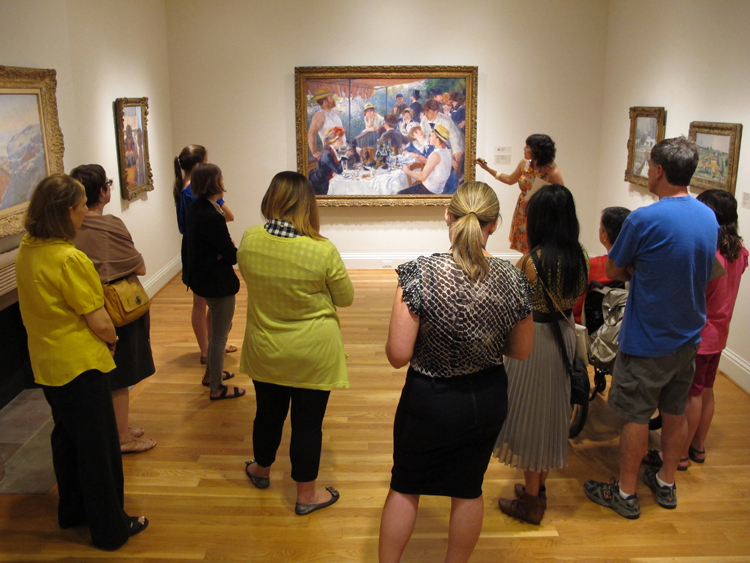 My first day working as a Museum Assistant at The Phillips Collection happened to be the opening of Renoir and Friends. By some administrative fluke, or perhaps as a test, I was assigned to guard the pride and joy of the collection and the centerpiece of the show, Luncheon of the Boating Party. Renoir has become a bit of a divisive artist in the art world. Beloved by much of the general public, he is remembered by his detractors for cloying pastels, mushy vegetation, and vaguely voyeuristic nudes. 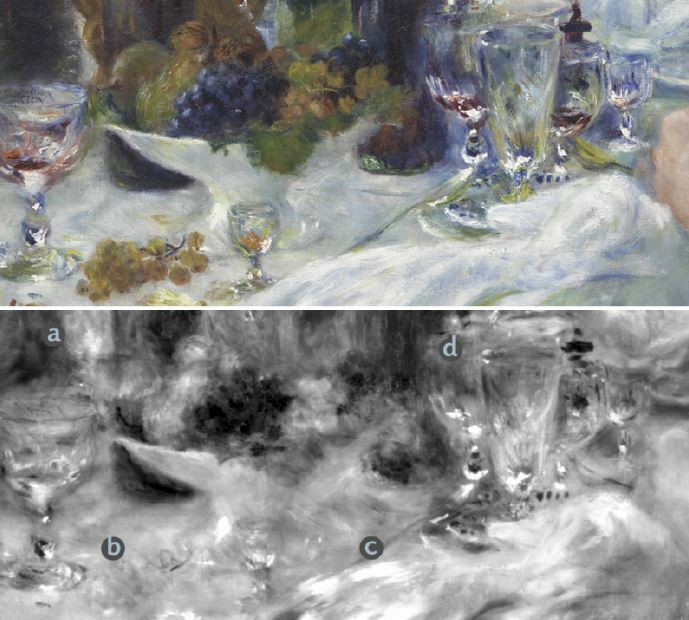 In some circles, Renoir has come to stand for “easy art”—the type of art for people who don’t know much about art. This attitude even made its way into mainstream media when, in 2015, art students protesting Renoir’s art, picketed outside the MFA in Boston holding signs proclaiming “GOD HATES RENOIR” and “reNOir.” The Atlantic ran a piece titled “Why Absolutely Everyone Hates Renoir.” The Guardian, The Smithsonian Magazine, and NPR all followed suit and ran pieces on the artist’s maligned reputation. With all this floating around in the back of my mind, I was curious to see what it would be like to guard arguably Renoir’s most famous work. If I was expecting impassioned tongue and cheek protests I was sorely disappointed. I didn’t, however, see the sort of superficial adoration that super-famous works (think the Mona Lisa) seem to provoke. Instead I witnessed people of varying age, race, gender, and physical ability pay homage to art that genuinely seemed to matter to them. The Luncheon of the Boating Party, like Jacob Lawrence’s Migration Series or the Rothko Room, is a sort of pilgrimage destination within the Phillips. People would arrive at the final room of the show and break into beaming grins, eagerly snap pictures with friends, or fall into sobered silence when finally face to face with this masterpiece. On some occasions visitors would come up to me or my colleagues to express their satisfaction and comment on how wonderful it must be to work at such a place. It was moving to see art matter as profoundly as it did in the gallery with Luncheon of the Boating Party. In a world where our attention spans have been so shortened; where we have become desensitized through the sensationalism that bombards us daily, somehow the aura of this painting still has the power to move people either to joy or (perhaps even more impressively) to humbled silence. Whether or not this makes Renoir a great artist is somewhat beside the point. The reactions to Luncheon of the Boating Party are evidence that art can still matter to us collectively in profound and personal ways. In this sense, it doesn’t matter if the people gazing glassy-eyed at the painting “know” anything about art or art history; it seemed to strike them at a human level and in a way that reminds us all of the most fundamental point of art and its creation: to build connections within and between people.